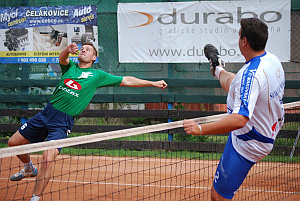 On September 8, 2012 the second semi-final match of Footballtenis playoffs league was played between the teams from Čálovice and Modřice. After nerve wracking battle the home team won 5:4 and because of it evened out the score of semifinal series to 1:1. The footballtenis players from Čelákovice were again helped by their blue and white shoes from Botas created specially for the players by BOTAS.